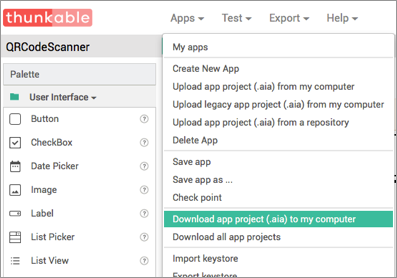 You can share your app in an executable form (.apk) that can be installed on a device, or in source code form (.aia) that can be loaded into Thunkable and changed. You can also distribute your app on the Google Play Store . First make sure you are happy with your app name and icon. Click here for instructions on how to change them. Open the app project you would like to download. 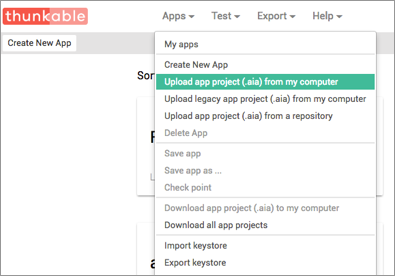 Choose Apps | Download selected app project (.aia) to my computer to export the source code (blocks) for your app. The source code is downloaded as an .aia file. 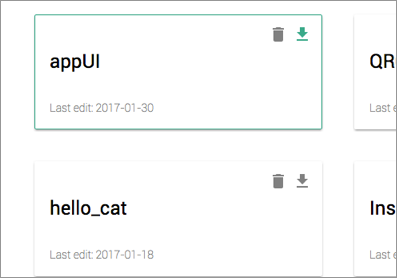 If you send it to a friend, they can open it with Apps | Upload app project (.aia) from my computer. Package the app (.apk file) by going to the "Export" menu on the Thunkable toolbar. Select "App (save .apk to my computer)." A pop-up box (seen below) should alert you that your download has begun. Note: The other option (provide QR code for .apk) produces a scannable QR code that will download the app for two hours. You can share this code with others, but they have to use it within 2 hours of your generating it. You can also download the apk directly from your apps home page by clicking on the download arrow next to any app project. NOTE: Anyone installing your app (which is an ".apk" file) directly, instead of from the Play Store, will need to change the setting on their phone to allow installation of non-market applications. NOTE: The source code (.aia) files are not executable Android programs -- those are .apk files. The source code is also not Java SDK code -- it can only be loaded into Thunkable.